It is a very cost-effective way of getting audiophile amplification at a rock-bottom price. 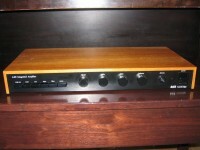 A&R Cambridge’s first product was the A&R Cambridge Ltd. A60 integrated amplifier, released in 1976. It soon became a classic product, admired for both its sound and its restrained, sleek appearance and its high-end sound performance. The A&R Cambridge (now Arcam) A60 integrated amplifier was produced between the mid 1970's and 1980's in the sort of quantities that very few other items of hi-fi have ever matched. Many thousands were sold to satisfied customers over that time and an amazing number are still in use today, a quarter of a century after the first A60 was produced. The A60 still performs well when auditioned along side most of the modern budget and mid-price amplifiers. It's a very reliable and stable amplifier and will produce a fair amount of output without presenting any major problems. The A60 is a very good amplifier.